The 2012 edition of the Intermot, the motorcycle show in Cologne, Germany, brought some news about the 2013 motorcycle models but not all of what will happen in 2013 transpired. It looks like some manufacturers will wait for the 2012 EICMA in November in Milan, Italy, to unveil their new 2013 models. From my Italian contacts I got a preview of what is new from Ducati, beyond the 2013 Multistrada 1200. And we have been hearing rumors from the BMW and the KTM camps as well, besides Suzuki and others. There should be a few good surprises along the way. I’m mostly talking here about the bikes in the Enduro or adventure range – that is the slice of the market to which I pay the most attention. I have my eyes set of the new 2013 Multistrada 1200. Ducati has already released official information on this bike. It is an evolution of the 2010-2012 models, a substantial evolution, I would say. Not much on the body, but mostly on the motor, suspension, ABS system, and electronics. The fairing has increased in size, the headlights changed slightly and have LED low beams. But the most important changes are in the motor and the suspension. Ducati is calling this motor a second generation of the 1200 Testastretta 11 degrees motor. Or Testastretta DS. Changes made it more useable and smoother on the lower RPMs, there is a small increase on torque, about 5%, and an increase in fuel economy, a 10% improvement at 60 MPH. These changes are small, but major, in my opinion, because it took care of that infamous lumpy cycle or hesitation or whatever people called what made those bikes difficult to ride at constant speeds at low speeds. 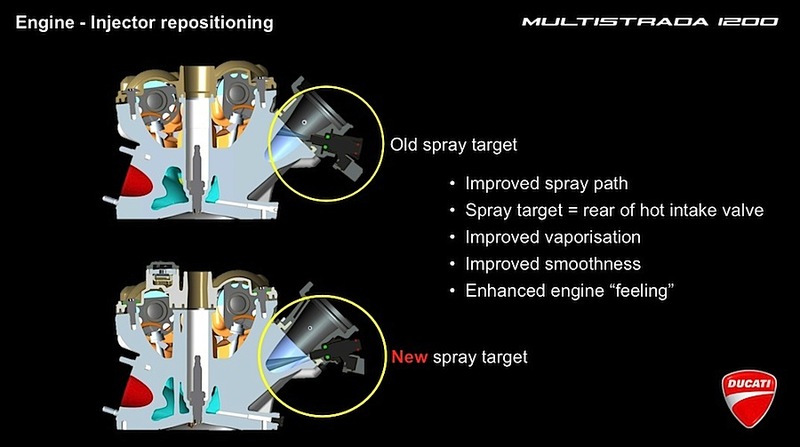 To achieve this, there was a change on the angle by which fuel is injected in the motor, an extra spark plug was added per cylinder, now it is a dual-spark, hence the DS (dual-spark is not new in the industry, nor at Ducati. My 2006 BMW Dakar was a dual-spark motor). These changes, combined with a secondary air system, optimize fuel burning reducing the low RPM cycle to cycle variation that caused that hesitation when cruising at low RPMs. Actual reports from journalists who already turned a wheel on this new bike indicate that the infamous “lumpy” factor is finally fixed. Another change is in the model line up. The “S” model is now the Pikes Peak. And a GranTurismo model was added to the line up. The Pikes Peak gets the look of the official Pikes Peak racer, an accurate replica, they say, of the bike that won the 2012 Pikes Peak race. It comes with assorted carbon pieces, the very light forged Marchesini wheels, and Termignoni exhaust. It is a beauty and… I have my eyes set on this bike. 2013 Multistrada 1200 Pikes Peak. Official Ducati photo. The Grandturismo (will it be called a GT?) comes with engine protection bars, a taller windscreen and larger bags, among other amenities that make it a better tourer. 2013 Multistrada 1200 Granturismo. Photo from Ducati press release. The most important change, and most controversial, and you may have observed it already just by looking at the photos, is the absence of the traditional golden forks. Yes, Ohlins is gone. In its place, progressive Sachs springs associated with the Skyhook semi-active suspension system. In the Italian forums, this has been a controversial discussion item for weeks already. Ohlins is dear to many motorcyclists, despite of its high price (or because of it) and its reliability problems. And if that is not enough, only one other motorcycle has a semi-active suspension similar to this, the just released BMW HP4. The Skyhook system is an off the shelf product and has been in Maserati cars for more than 10 years already. But for the motorcycle consumer’s perspective it is an unknown and untested technology. This controversy will last a while, the Ohlins widowers are crying foul already. They already miss the bling factor of the Ohlins, which is big in many sectors of the moto world, but most importantly, in the future as more bikes move towards semi-active suspension systems, we may look back and talk about missing the intuitive feel of passive suspensions. Moto-journalists who have ridden the new bikes with the Skyhook suspension have made positive and negative comments, mostly positive at this point, some are not sure about what to say. For now I’m open to see what this technology will bring in terms of rider comfort, when comfort is wanted. I’m keeping a positive outlook on this new suspension. For one thing, the Multistrada may be targeting an older audience, making space for the younger audience to move to a smaller, entry level Multistrada (yes, that is part of the news from the Ducati camp!). Another evolutionary change on this bike has been done to the ABS system, now operating in a two channel system. Also, changes to the system allows for the rider to change settings and allow front and rear brake action to be connected (linked) at different levels of connection according to the riding mode selected and level of ABS intervention desired. For example, on touring mode you may have a connected level actuation, where pressing only the front brake will actuate also the rear brake. But on Enduro mode the ABS will be present on front brake actuation, but will not intervene on rear wheel actuation, so the rider may be able to lock the rear wheel. 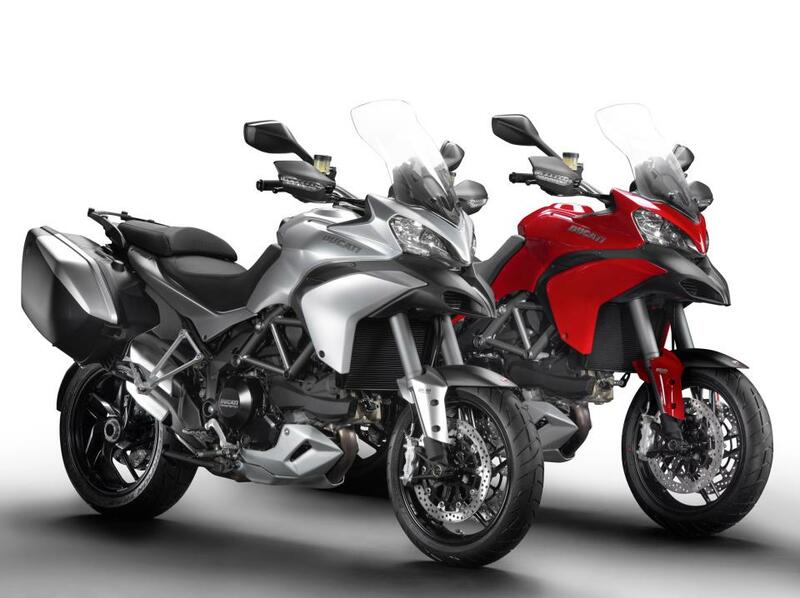 But the 2013 Multistrada news are old news, as these rumors have been discussed at length in the Italian forums already for a while and Ducati’s official release of these bikes took place more than a week ago. What is really new today for Ducati and we will need to wait for EICMA to see them is what my Italian sources told me a few days ago. They say three new bikes will be out soon and are based on a new, water-cooled 90 degree V-twin 820cc motor, 115HP (unconfirmed, I also heard of 113 HP), torque at 66 ft/lbs, pre-set performance maps (just don’t know if it will be a four or three level map – might depend on the model) and other electronic aids. And this 90 degree V-twin motor may be sitting at a different angle within the frame as well. The motor is an evolution of the 848 Testratretta, like the one on my Streetfighter. And the other interesting part of this is to find out what these three new bikes will be. 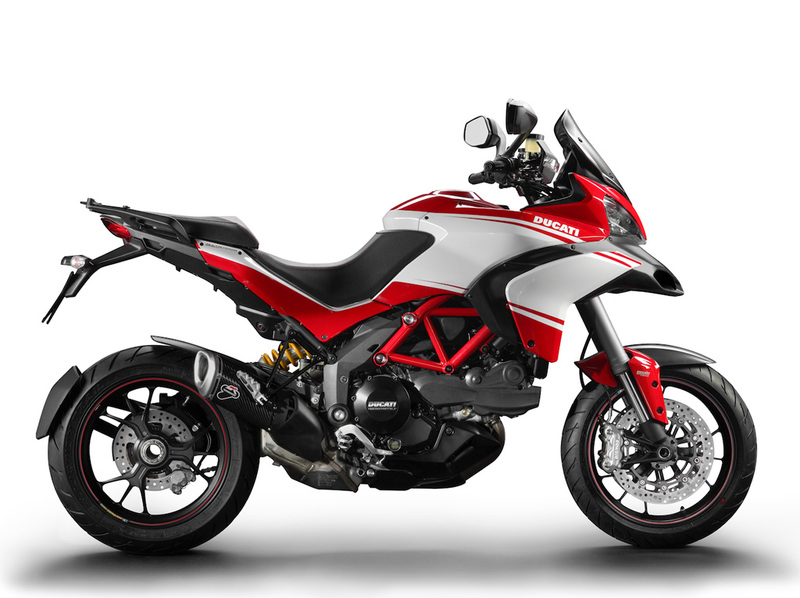 The rumors point to an entry level Multistrada, a HyperMotard (an obvious element here is that Ducati did not unveil 2013 Hypermotard bikes in Intermot, they only had the 2012 models there! ), and a yet to be named Roadster, which could slot in the middle of the 20 year old Monster and the aggressive Streetfighter, or who knows, eventually replace one of the two, or could it be a smaller entry level Diavel style bike. We will need to wait for EICMA in november 13 to 18 in Milan to know more about this, about a month from now. It will be an interesting situation at Ducati, with the current line up of Hypers, Monsters and Streetfighters. All for the better, I would say, but Ducati could as well be in the process of cleaning up their motorcycle line up. And BMW, well, people have been talking about the water-cooled upgrade to the old oil-cooled 1200 for a while now. The new 1200 GS, it turns out, is not 100% water-cooled. BMW engineers channeled water cooling only to the most critical areas of the motor where water cooling could be more effective. Several parts of the motor remain essentially air cooled. It seems like a strategic way to keep the weight of the motor down and the motor area smaller. Horse power has increased to 125 BHP. Although many changes were made to this bike, the essential GS look remains. Perhaps a bit more angular, with design features that match the already released 2013 F800GS. To be honest, I don’t quite like that beak and headlight assembly. It is not quite the transformer look. Not that I like the transformer look. But I appreciated that more industrial of the former 1200 GS. But I like the small changes made to the F800GS. Aside from the motor, major changes took place on the electronics, ABS, riding modes and electronic semi-active suspension, perhaps not unlike what Ducati has in the 2013 1200 Multistrada. 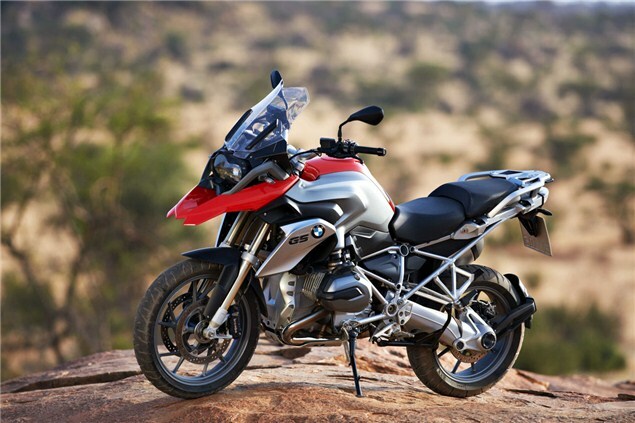 The 1200 GS is the most popular bike in the BMW line up, it is the most popular motorcycle in the entire “Adventure” segment. I’m certain it will remain there with these changes that were not too radical. I don’t think the typical, more traditional, BMW R1200GS owners and potential owners wanted to see radical changes on this bike. Like we say in soccer, you don’t make changes in the line up of a winning team. Except perhaps you need to keep up with the evolutionary technological aspects that keep the bike competitive with the others in the segment. Everyone, including even KTM, are adding electronic aides to their Adventure bikes. And what about the F800GS? Is the 2013 model that are on dealer floors today all we are going to see from this mid-range bikes or does BMW has something up their sleeve? The 2013 line up sees KTM raising the bar on their Adventure and Adventure R models. Motor displacement is now 1190 cc, with 150 BHP. 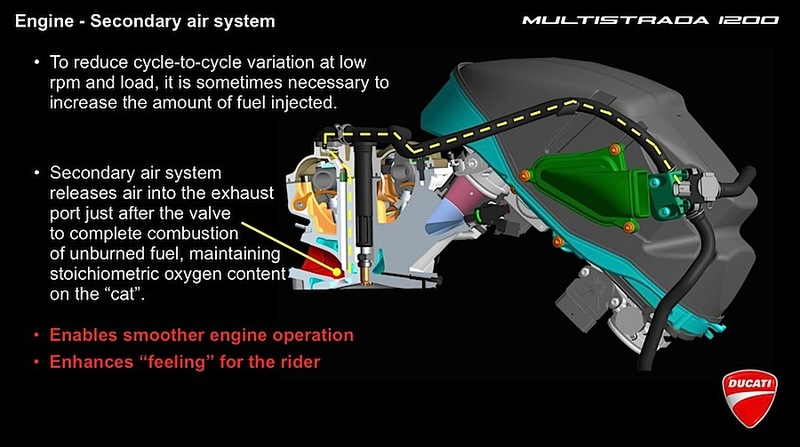 We are talking here Ducati Multistrada levels! But on a more off-road package, mind you, especially on the Adventure R model. This bike will also have traction control and selectable riding modes. You see, even KT makes an effort and blends in with the crowds in this sector, while remaining more off-road oriented than others, it seems. I hear this model won’t be available in the United States until sometime next year, as a 2014 model. 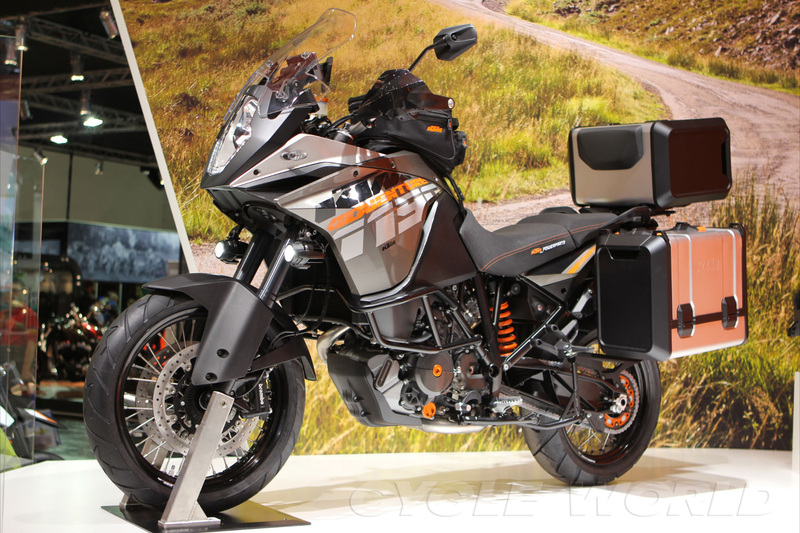 A concept for the V-Strom 1000 was available in Cologne. The concept shows a trend not unlike what we’ve seen in the DL 650 that moves towards a more off-pavement oriented idea. I say “idea” because these bikes will probably remain more pavement oriented than the other bikes of these segment. 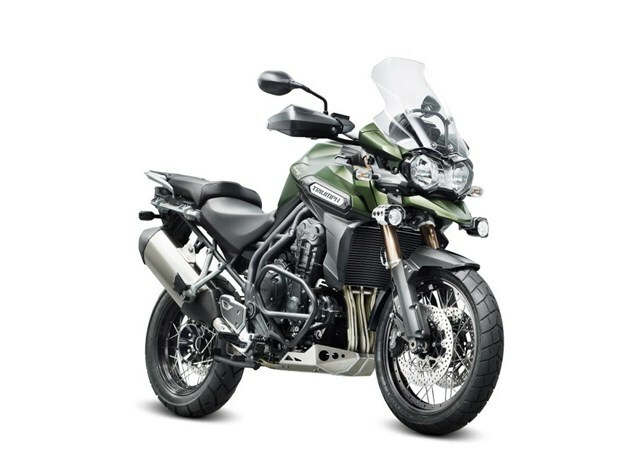 Triumph released their 1200 Tiger Explorer XC. This bike has already been officially presented. It certainly is a contender in this segment. I don’t know if Yamaha made any changes to the Super Ténéré. It is not like these bikes are too popular with the public in the United States, despite its competitive price, and considering the equipment that is included in this price. It is a mystery. Certainly it is not related to the quality of that bike, as it has already a great proven record. And it has the Ténéré name to go with it. Moto Guzzi made a few changes to its Stelvio line up last year, with the introduction of the NTX and the larger gasoline tank. It has not been aggressively marketed in the U.S. but it has a strong, although relatively small, group of followers. It is a great looking bike. Other than that, I guess we will have to wait for EICMA in November for more news on all motorcycles in the Adventure segment! Those sure are some pretty bikes. I think 2013 will be a great year for motorcycling as so many new models are coming out and older models (such as the Suzuki SFV ‘Gladius’) are returning after a 3 year hiatus. Yes, lots of interesting bikes. Also there are talks about a 1000 Strom being brought back in a much more “adventure” looking package. Tomorrow we will start hearing more about what is coming up. Even if I don’t buy the bikes, I’m always interested in knowing how technology advances. with the depressed world economy the past few years, few models were introduced . Perhaps this means that they think things will pick up this year with more sales. I am sure that R&D departments haven’t kept still but it costs money to introduce new models and they need sales to cover the R&D costs. It’s always exciting to see new models and sit on them at the M/C show. Our big one is coming in January 2013, much larger than the Seattle one in past years, plus many more manufacturers and sellers of accessories. Well, despite the depressed economy of the last few years, the adventure sector of the industry has brought great new bikes to the market. 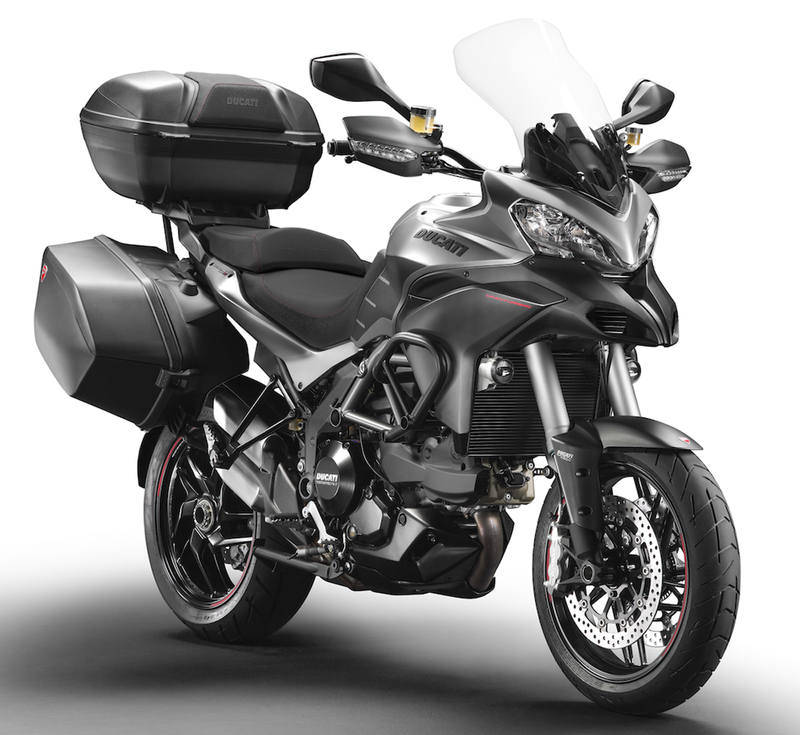 Just on the 1200 slice of the market there was the Multistrada (2010), the SuperTenere (2011) and the Triumph Explorer (2012). On the midsize sector we had the F800GS (2008), the Triumph Tiger 800 (2011) and the Honda NC 700 (2012). 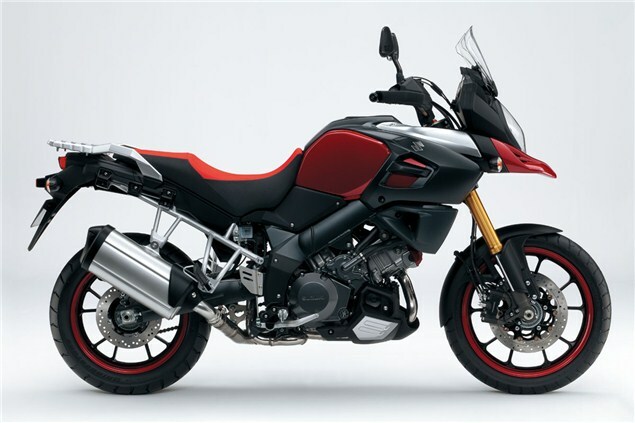 And now we have the water cooled BMW 1200 (or we should say semi-water cooled now that we know the details), an upgraded Multistrada 1200, and the Triumph Explorer XC. This people have been working ’round the clock bringing new developments throughout the crisis period. This is the motorcycle sector that was least affected by the low economy. I think your BMW 1200 R is a great bike. It is not a very popular bike in terms of sales, but it is quite a nice machine, and it is great looking as well and its design will remain unique and will survive the times. It is a great score, in my opinion. Much better than a V-strom, either the new or the old, in my opinion. I had been looking specifically for the R1200R for a couple of years, but for a good “pre-owned” one. Up here new they are around $20K (in touring mode), much more than I wanted to pay. It is a classic style with basically the proven GS engine but in Road trim. It has a cult following. I wanted something lighter than my ‘Strom and it feels like a 100 lbs less, and it has lots of power, not quite up to your Duc, but still 109 HP and only weighs 492 lbs wet. I’m still trying to get used to the 4 piston brakes as the ones on my ‘Strom are barely marginal. You got yourself quite a nice bike, and I like its color too. The V-strom is a great bike, but it is also of that high utility level. Suzuki’s intention with that bike was never quality or performance, just efficiency and it probably is very efficient and at a low cost and low maintenance as well. The BMW is different. The R1200R is probably the only BMW of the R1200 level that has really interested me so far. Hope you enjoy it well. Hey GiL, that Multistrada Pikes Peak is a very nice bike. I’ve ridden the Multistrada 2010 twice. It is an awesome machine, exactly like you described, and that before any of the changes made to the 2013 mode that should make it even better. Let’s see what will happen. Moto Guizzi Stelvio 1200 ntx would be a complete champion if it has a water cooler! They should have thought about that. I love its look and features but don’t want to have it without a water cooler. I am interested in having a bike with shaft final drive, abs, and water cooler. Such moto bike is one of few best look bikes. Unfortunately, it has no water cooler. Wonder and hope they will make and sell 2014 stelvio with shaft drive, abs, and water cooler this summer. I am thinking about Triumph Tiger Explorer a little bit right now. I believe Moto Guzzi will eventually need to introduce some form of water cooling to their motor, as well as other upgrades. It is a nice motorcycle, and it has one item that is great: a large tank allowing for more than 200 miles before you need fuel. I just completed a 400 mile tour in my Multistrada, and I know it can do a 200 mile run with one tank, but it is cutting close, not a good idea if gas stations as far and between. Back to the Moto Guzzi, let’s see if Piaggio, its parent company, wants to invest or not on this bike. A decision will have to be made soon, I believe, because the competition have taken their bikes one notch up (or more) on the current model year.